Here in Japan we are in the midst of "Golden Week," a cluster of unrelated holidays from April 29 to May 5. Mysteriously, EVERYONE in the country believes this is a great time to travel. The highways and roads are gridlocked; the train stations and airports overcrowded. And, needless to say, the price of everything travel-related skyrockets. April 29: Greenery Day (Midori no Hi). This day is set aside for celebrating nature. Plant a tree, water a bush, and all that crap. May 3: Constitution Memorial Day (Kenpo Kinenbi). Designed to commemorate Japan's new peace constitution. May 4: People's Holiday (Kokumin no Shukujitsu). I have no idea what this holiday is about. Sounds weird, though. May 5: Children's Day (Kodomo no Hi). Formerly called Boy's Day, this holiday "celebrates the growth of children." On a painful note, the government here raised the consumption tax from 3 percent to 5 percent April 1. This VERY unpopular move was behind a recent boom in big-ticket sales because consumers now have to pay significantly more for everything from a can of corn to a Corolla. But that's not all, folks! April 1--which marks the beginning of fiscal 1997--was also the day a nifty new 0.7 income tax hike took affect. Gosh, I love the tax man. NOT. I read that the average resident will now spend 50,000 yen (about $410) more per year for goods and services. Another day in the life of Japan Inc. and the hapless consumer. Spring in Japan begins with "o-hanami" (cherry blossom viewing). This event, in Tokyo at least, is not exactly pleasant. 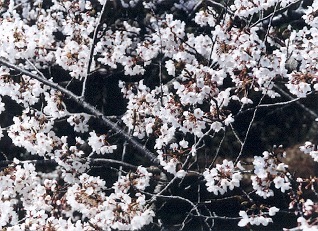 Cherry blossoms are delicate and the optimum "viewing time" lasts only a few days. This means that there are far too many people crowding into parks during the last weekend of March and first weekend of April, all battling for tiny areas of grass on which to sit with friends, family or co-workers. I'm not sure, but I think the idea is to get as drunk as you can as quickly as possible. Last year we saw a man take off all his clothes and climb a tree. Then the police came and took him away. Some companies even instruct a couple of employees to camp out on large plastic sheets in key cherry-blossom areas throughout the city on a Thursday to assure a spot for the other employees and the boss on Saturday afternoon. However, rain usually--but not always--guarantees plenty of space to all those foolish enough to sit outside and get wet. These people do more than simply "view" the cherry blossoms--they wear them, as well. Back to The Diederich Journal.